The Rosarito Foreign Residents Assistance Office hosted a Public Safety Seminar on February 21 at the CEMAC auditorium. Olivia de Corral moderated the meeting, which included the following civil servants: Police Chief Eduardo Montero Alvarez, Rosarito PGJE Attorney Lic. Rafael González, Chief of Civic Protection Octavio Mendez Stoever, Director of Economic Development and Tourism Lic. Héctor Reyes Orrantia, and President of the Citizens Committee for Public Safety Lic. Ricardo Moreno. 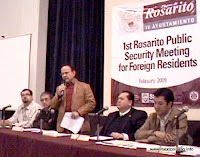 First to address the many foreign residents (in English) was Rosarito Mayor Hugo Torres. He began by explaining that last year the police force was interrogated and a series of confidence tests were performed on each officer. This resulted in the loss of 50 percent of the force. New officers have been hired and now a team is in place that can provide safe, secure public safety to all citizens of Rosarito, the Mayor explained. Other advances from the city are the implementation of a new “Tourist Police” with distinctive uniforms and squad cars. They are equipped with special training to deal with foreign visitors and residents, including English language classes at the UABC to improve their communication skills. He highlighted the improved coordination between the City, State and Federal law enforcement agencies, including the Military. Mayor Torres summarized the presentations of the panel, which began by explaining the implementation of the anonymous 089 phone number to call for reporting crime or suspicious activity. You will not be asked your name and the call will remain anonymous. 066 remains the emergency number statewide, which routes calls to the appropriate agencies nearest your community for immediate action to your emergency situation. The budget for public safety has increased 20 percent this year with the help of $10 million pesos from the Federal Government if the city raises $3 million pesos, which will go toward further confidence testing, equipment, salaries, training and hiring of new officers. As many residents are already aware, Mayor Torres explained that the violence, which has spilled over from the Tijuana drug cartels is mainly due to last year’s arrest of Arrellano Felix and subsequent turf wars. Fortunately, visitors and foreign residents are the least likely to be involved in these activities and, for the most part, safe from harm. He ended his introduction with a lighter note about moving traffic violations are now bilingual, with an explanation of the various fines on the back of the ticket as well as the ability to pay fines by mail in the U.S.
After several presentations, there was a lively question and answer session during which residents voiced some concerns. Many of the issues were routed to the proper agencies and a promise of follow up was assured. We are certain foreign residents were gratified with the efforts of the local leaders that are concerned for the safety and well-being of the community as a whole and look forward to timely updates in the future.